Woot woot! We made it, guys and gals--it's finally the Easter long weekend! I was feeling uninspired this week, as I stared at my ample collection of pastel colours, wondering what the heck I was going to do. Luckily, that's when I remembered Pinterest. Haha! 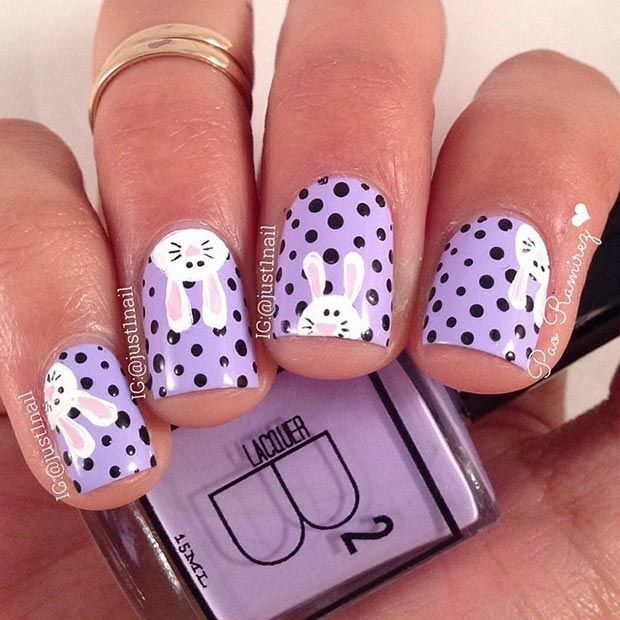 I found this mani (by IG nail artist, Paula - @just1nail), and fell in love with the idea of doing a dotted background, with a little peek-a-boo bunny in the corner. So...well...that's what I did. Haha! For the dotted fingers, I started with two coats of At Vase Value, and then added either Bea or Cake Pop, using a medium dotting tool. To make sure my dots were even, I started with the middle three dots, and then worked my way out. The glitter finger has one coat of At Vase Value (which was streaky, but okay because I knew I'd cover it with sparkles), followed by two coats of Ho Ho Happy Holidays. When that was dry, I used a large dotting tool for the big Cake Pop dot. The bunny was slightly more complicated, but I've found that instead of just jumping right in (ha) and free-handing a design, it's better to outline it first. And using Rite Stripe lets me start over if I mess up (as a quick swipe of acetone takes it right off). After outlining the bunny head and ears, I filled it in, using a thin nail art brush and proper white polish, Paper Mache. I used the same, thin nail art brush, for the middle of the ears, with Dance Baby, as well as the nose (which I forgot to do upside down, so my bunny nose looks a little cat-ish. Whoops! Haha!). The eyes were a real bey-otch, but I prefer the look you get with a black outline, white middle, and black pupil, so I used the same medium dotting tool to first make the black dot, with Black Expressionism. I let that dry for a bit, so the next dot wouldn't bleed too badly, and then added the white middle with Paper Mache. Finally, I used my smallest dotting tool for the pupil. To get the thinnest whiskers possible, I used Black Rite Stripe. 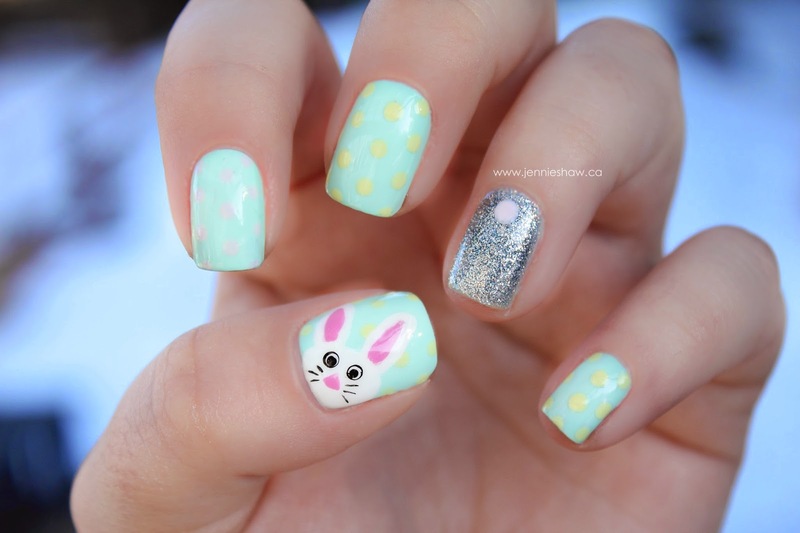 I'm so happy that I have a super-cute Easter mani for this weekend. Thanks for the inspiration, Pinterest! Haha! I ADORE THESE NAILS!!!! That bunny is so perfect - your patience paid off :) Happy Easter! 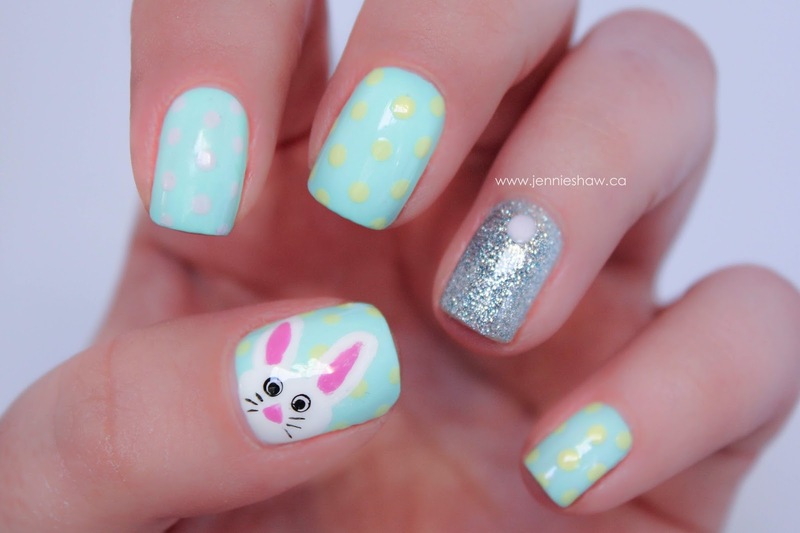 You nailed the bunny - love the round eyed, inquisitive look! That bunny is so cute. Happy Easter.